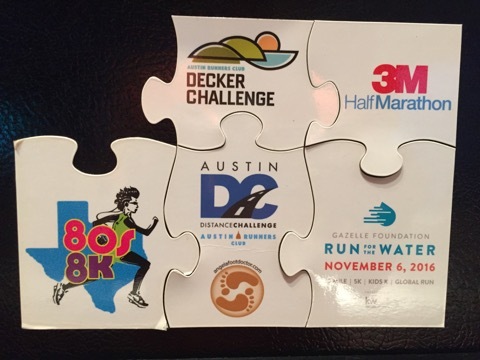 On July 19, 2016 I, for whatever reason(s), decided to sign up for the Austin Distance Challenge. This challenge consists of five road races: an 8km (5 miles), a 10-miler, two half marathons and a full marathon spanning five months. 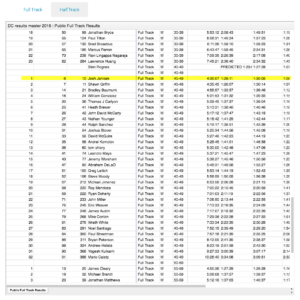 After the first race I found myself in 3rd place in my age division (40 – 49-year-old men), which is a lot of places ahead of where I thought I might find myself. Now that I think about it, I know exactly why I signed up for the distance challenge. It’s because I’m competitive. I vividly remember that very first day when I ran four times around the middle school track. As I was panting, on the verge of puking and passing out, I looked down at my phone and saw that I’d run one mile in eight minutes and one second. That one second bothered me because I knew that if I tried harder, I could run faster. And ever since then, I’ve competed against myself to make myself better, faster and stronger. After a couple more races in the distance challenge I found myself in first place. I can’t lie. There’s quite a bit of pride that goes along with being in first place. It’s like, after 40 years I’d finally found something that I’m really good at. 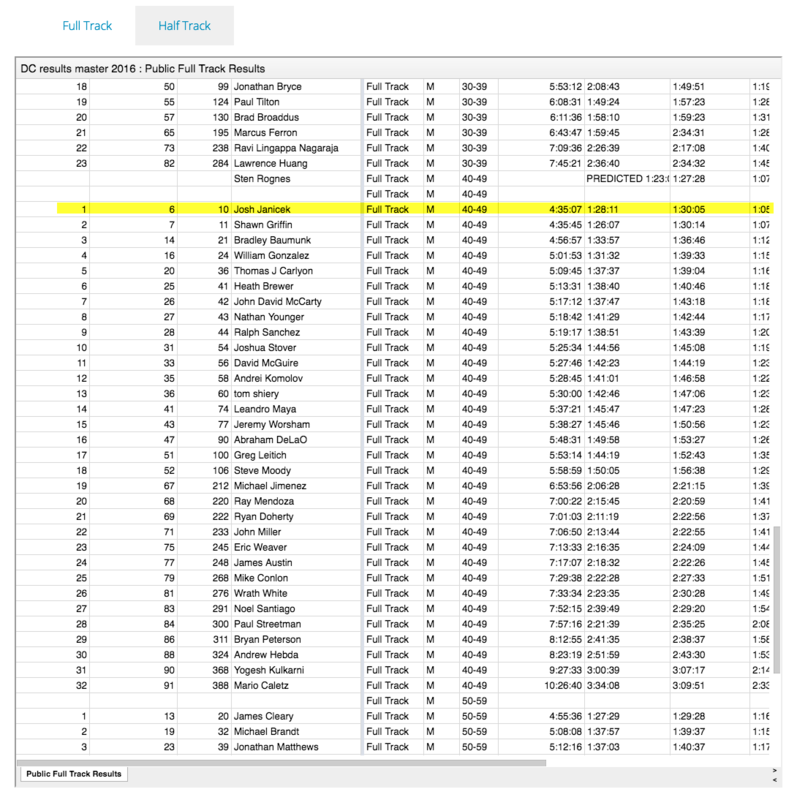 Bear in mind that I moved up to first place only because the guy who previously held first place injured himself and had to DNF (“Did Not Finish”) our last race at the 3M Half Marathon. And as I type this, I’m suffering from an injury incurred at 3M. Thankfully I didn’t drop out of the race, but I really wanted to between miles 7 and 13. And I was hurting after the race. I had my usual nagging pain in my left hip, and a newly acquired sharp pain in my right knee, which I’ve self diagnosed as Pes Anserine Bursitis (self-diagnosis is the absolute worst thing to do). I tried to go on a recovery run the Monday after the half marathon. The pain in my knee was still sharp and caused a limp in my stride after a mile in (this is not a good thing). So I prescribed myself with a week to 10 days rest from running. After my painful 2-mile recovery run, I decided that I should finally heed everyone’s advice and do some strength training. I’m a stubborn runner. I’m not a lifter. I’m not a stretcher. I’m not a cross-trainer. I’m a runner. Well, it finally caught up to me. I’d injured myself early last year to the point where I went to the doctor and was prescribed two months of physical therapy three days a week. I liked the massages and the ultrasound, but I didn’t like the homework (the stretching and strength training). I should’ve listened to and done what the doctor told me to do. So I’ve been doing all kinds of strength training every day since this latest injury. If I can’t run, I need to do something, and it’s better to try to strengthen the areas that have been neglected and quite possibly the source(s) of injury. I went for a 4.5 mile on the 10th day. I started feeling the knee at around mile 3, and my knee kind of nagged me for the rest of the day, but thankfully it wasn’t a sharp or nagging pain. This pain & injury comes at a very inopportune time. I have the full marathon coming up on February 19th. Since being injured, I haven’t been able to go on some much-needed long runs in preparation for the marathon. My current plan is to continue my strength training regimen. I’m going to try to go on a long run tomorrow and (fingers crossed) if it doesn’t debilitate me, I’ll put in some modest miles between now and the marathon. If I can’t make it, I guess it’s back to the physical therapist and a professional recommendation on my physical ability to run the marathon. I had a long conversation with Elise and while I’m competitive and would love nothing more than to place in the distance challenge, I’d rather have my health. A good friend taught me to grade my races. If I’m healthy enough to run the Austin Marathon on February 19th, I’ll consider it my “B” race for this year. It’ll be a training race for my “A” race, which is the Light at the End of the Tunnel Marathon in Washington in June.